As most readers know, we love to take our gear out into the wild. When we first saw the Exo Labs' Focus camera kit, we recognized that it was a very cool piece of tech. We also realized that the Focus was primarily designed for indoor/lab use. Of course, that is not how we roll. We started looking at options on how to take the "show on the road." 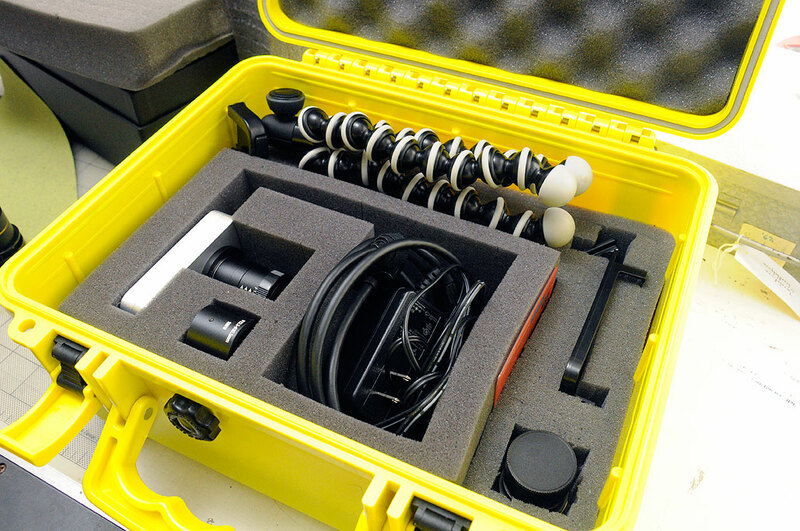 Today, we want to show how we configured an S3 watertight case to protect the Exo Labs Focus camera and its various accessories for when we do take it out and about. The size which appears to fit our needs best is their T6500 model. The case is about 12″x9″x6″, weighs a little less than 5lbs, and is made from high-impact ABS. It should have enough room for everything we want to stow plus a little bit of extra room should we want to add some other bits. We also decided on the yellow version for maximum visibility. The S3 case comes with three layers of foam in the main compartment and one layer in the lid. Two of the three main layers are made with Pick-n-Pluck foam. Those are the layers we used, along with the pre-cut foam from the Exo Labs Focus box, to form the protective compartments for the case. We tried a few different configurations, and placing it in the lower left seem the best. To create a snug fit, we swapped the cover’s thinner pad with one of the thicker layers from the main compartment. It’s a little deeper than the cover but offers a better overall fit. With one of the layers removed, the space gives enough room for the GorillaPod to fit nicely along the back. The placement of the pre-cut block allows the extra lenses and camera bracket to be placed along the sides and back with enough room for more items if needed. Yes, the Focus camera requires AC power to operate, but that just mean we will also need to bring along an 120V power source. Our next task is to work out the best way to power the Focus camera (AC 100-240V 50-60Hz 0.36A) on the go. We have several possibilities in house (Brunton Solo15, Clore power inverter), but are in search of additional options. If readers have any recommendations based on personal experiences, we would be eager to take a look. In addition, we are also exploring different methods of fitting an iPad mini to the lid of this case as part of the package. We will provide an update if/when we are successful in our attempt.